VSM Talk – The Fam is Growing! As the T-Rex bed we made the kids has lost some of its nostalgia, there is no more sleeping through the night around here. Currently, the first kid shows up at 1:30 a.m. and hops in bed with us, and the second rolls in around 3:45 or 4:00 a.m. This has been happening for the last month or so. Every parent reading this understands that while the idea of cuddling with your kids through the night sounds good, that’s not exactly how it works! It’s so much better to cuddle them up in the morning, after a full night’s restful rest. We all have our rough patches when it comes to little ones and sleep, so I’ll leave it at that — yes, we’re in a rough patch here at our house. Ha, ha! Anyway, the sleep situation has left me really hunting for any time to write down my thoughts. I just hate to be blogging when the kids are awake and begging to do something fun. So, for now, night-blogging will have to become my specialty, I guess. To start, I know some of you that follow on Facebook have seen that our vintage sewing machine (VSM) collection has grown in recent weeks. We’ve had the same three treadles for five or six years; and now, suddenly, we decided to add in two hand crank and a couple model 15’s to the mix. Why? Well, they are a little addicting, if I’m going to tell the truth. Treadles are definitely my first love, but I think I may have overlooked the importance of a hand crank machine in the collection. First of all, there are times when I’m working on something so small and tedious that I’m using my hand on my wheel anyway, and not the treadle foot plate. Secondly, treadles are extremely heavy and are a pain to move. But hand cranks are PORTABLE! Yes, I’m almost screaming that there. Portable is a whole new world as far as I’m concerned. Since my first run on the treadle, trying desperately to emulate my YouTube sewing professor, I’ve been sewing in a dark corner of our entryway. Even on the most beautiful, sunny summer days, I’ve been sewing in the same spot. No longer! Now we have a machine that I can take out on the patio! I can sew while the kids play (and watch them at the same time)! I want to share the first hand crank that came to us. 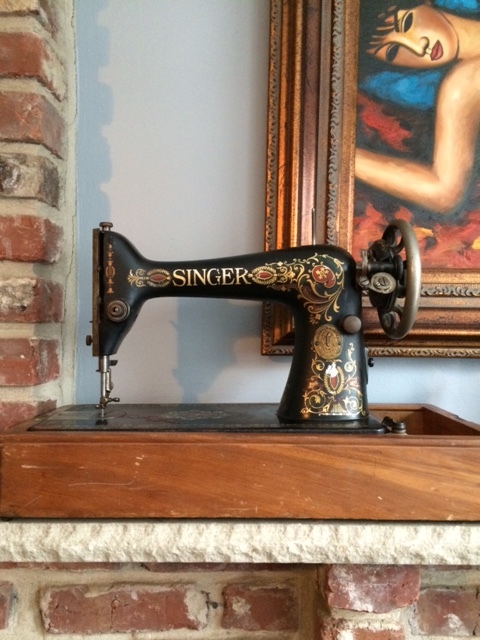 This adorable little 1934 Singer 99-13 is a mini version (3/4 size) of my favorite treadle, the 1919 Singer 66. It’s mostly for our 4-year-old to learn to sew, but also for me to sneak in some sewing time on it when she’s asleep. 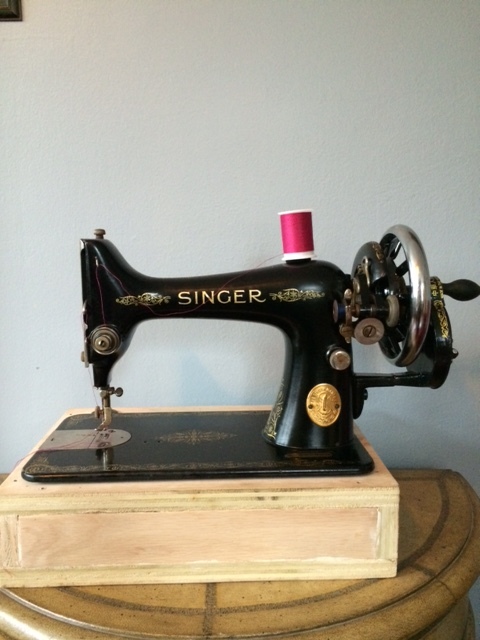 Our newest machine, a 1934 Singer 99-13. Why does this happen to me?! At first, I thought I’d take a picture and post it online to see if anyone else wanted to grab it. (And I hoped someone would!) No bites! So when Matt went to pick up the pheasant decal 15 (on Valentine’s weekend), he decided to bring home the 1951, too! I think I like him! This machine is the first machine I’ve owned that has reverse, and I have to admit, I’m having fun with it! These days, I am not online all that much; but whenever I do pop on, I’m moved to respond to the questions of those new to sewing that would like sewing machine recommendations. 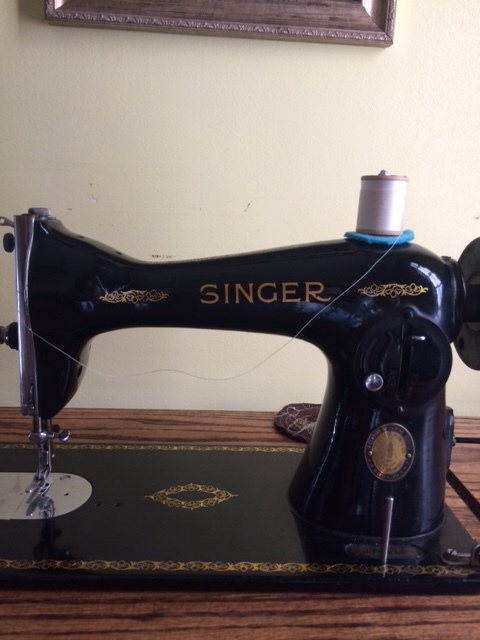 I would have loved when I was starting out with my first 66 if I’d have been able to hop online and find pictures, write-ups, and other helpful little blurbs about my new-to-me, right-hand iron lady. In my opinion, sewing machines today, the plastic ones, are made like modern refrigerators, programmed to be replaced. So why not buy something that was built to last instead?! Yes, please! That being said, I’d like to start a short, two- or three-part series on some of the machines we have here. I know there are places online to get reproduction manuals, but some of us are visual. Perhaps I’ll do some photos of the oil ports on the machines, how to thread, how to thread the bobbin, etc. Once you get acquainted with your machine, you’ll never look back. More than likely, more and more will just follow you home! First on my list, the Singer 66. That’s the first machine that I started on, and still one of my favorites. That will be the first machine I’ll cover in the series. Keep an eye out! What was the first vintage machine that got you hooked? 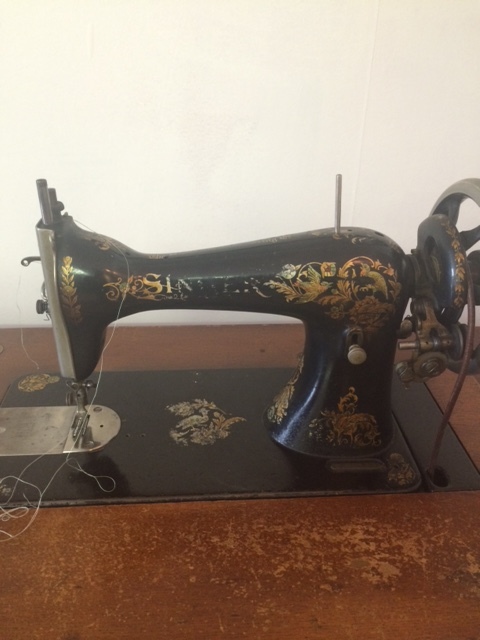 If you’re new to sewing and haven’t purchased a vintage machine yet, which one are you interested in? Please, please, don’t even tell me if there’s an amazing vintage machine that’s missing from our collection. My husband might kill me! Next > So You’ve Got Yourself a 66?! On matters of sleep and sewing machines……I relate to both. Many reasons why we didn’t always get very good sleep while raising kids. One baby was not a sleeper from the beginning and later, as a teenager she had a different internal clock that often kept her & us up all night. Even though we have an empty nest now, on occasion one of my grown kids still wakes me with a late night (8:30 is sometimes my bedtime) text or phone call. Sometimes though I can be found sewing late into the night on an old Singer sewing machine. A 66 electric was our first vsm. Also, our first treadle & hand crank are 66’s. You’re getting quite a nice collection. It’s nice how sewing and vsm’s is a family affair at your house with everyone involved.